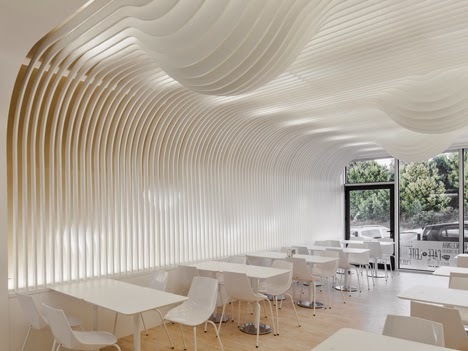 I don’t know who started it first but wavy slats seems very popular lately. 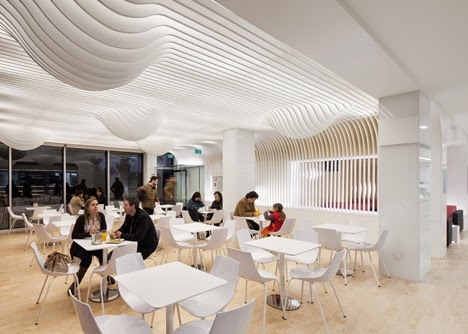 I am a follower of my favourite blog Dezeen, and when they posted about the OOZN Design wavy timber slats I already had this ”I’ve seen this before” flash in my head. 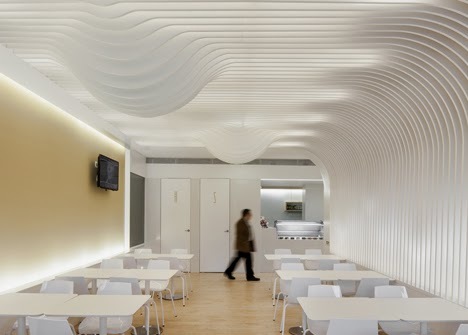 Not only me, as there were a few more comments but when I commented another person joined the flash saying that Dezeen already featured a similar wavy slats design from Paris. 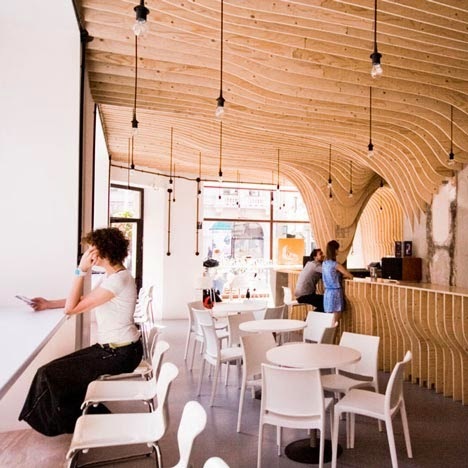 Just added: Reading further into Dezeen post I can see that they edited their post and added notes about those cafes! :) So they actually read our comments! So nice of you Dezeen! I have come across so many similar design concepts, it’s unbelievable. Some would say; ”Did they copy each other” or maybe they got similar design concept? I think this just meets the ”brief” criteria and no one is copying anyone. 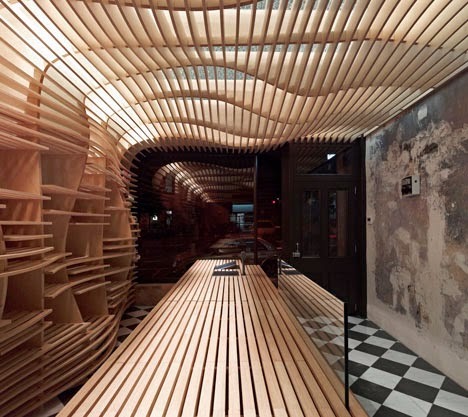 Wavy timber slat concept is not something unusual and it can look good in hospitality, commercial and retail spaces. 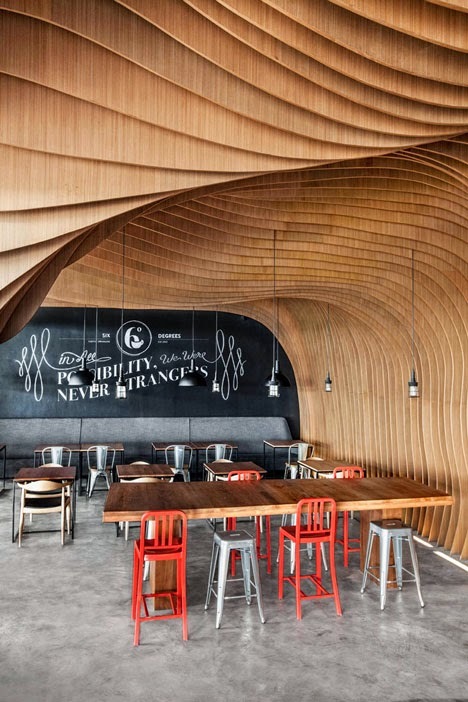 This style of the design also has superb opportunities! 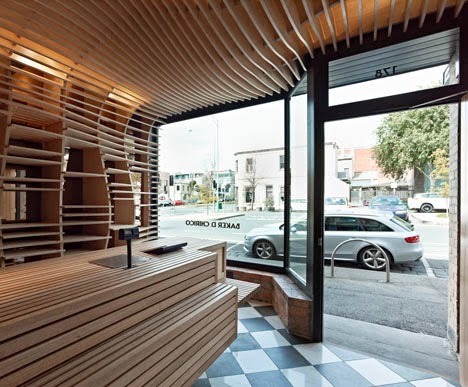 Because of the way the slats are joined next to each other, you can create little shelves, benches, space for lighting… the opportunities are endless!! I have personally researched this structure before, during my time at Uni and I have designed a similar style free standing one. 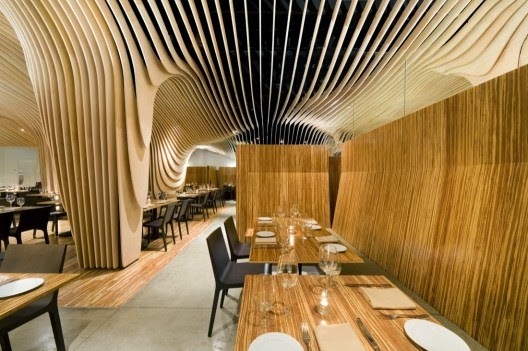 Although mine was a little different as each rib (slat) was created based from layered veneer. 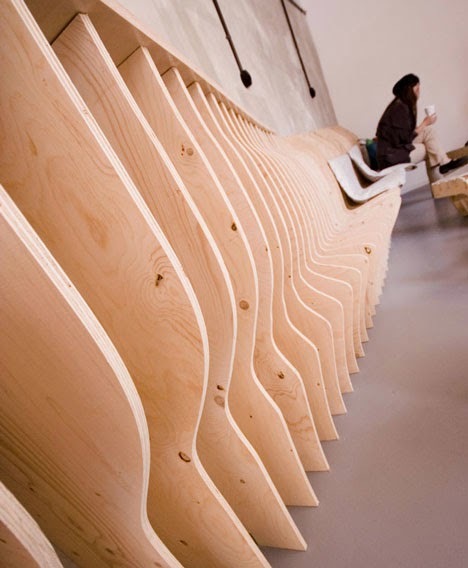 Once the veneer was layered, it was placed in a special form to hold strong and create the curve. It is called laminating. God, I loved this project! The results can be viewed here link to my Pinterest link board. 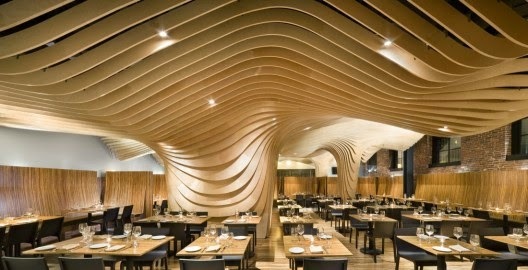 And also here click.These organic slat shapes can be made by using Rhino software. 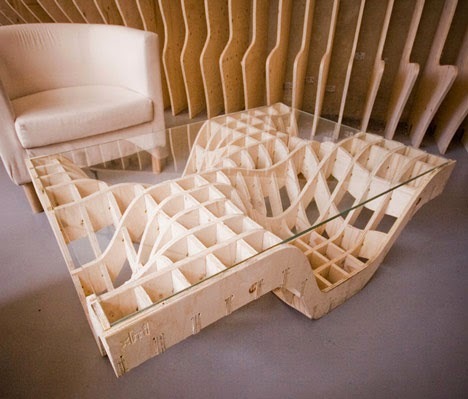 You can create many objects that can later be laser cut and just stuck together. 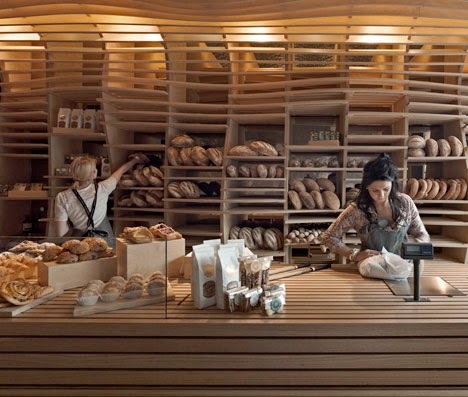 Back to the similar shaped cafes, bakeries and others. 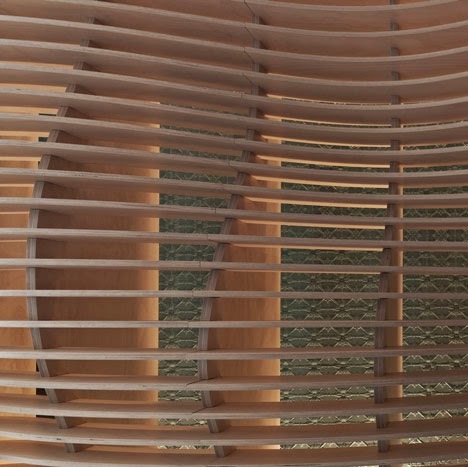 Let’s have a closer look at at more wavy slats designs. 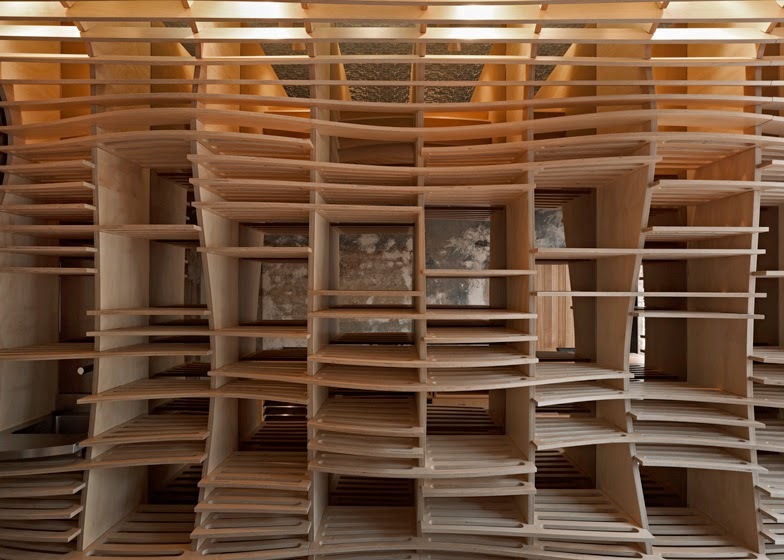 Let’s start with the one that started the whole discussion appeared on Dezeen. 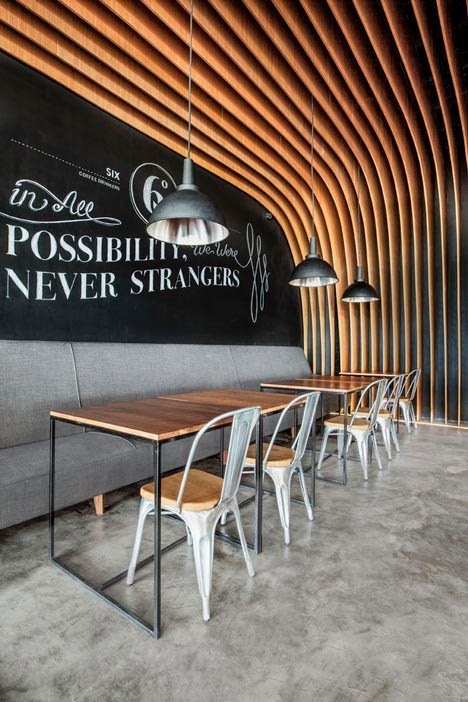 The 6th degrees cafe (appeared on 11 May 2014) The brief for the cafe located in a shopping mall in Jakarta was simple; to make the cafe memorable and cosy. 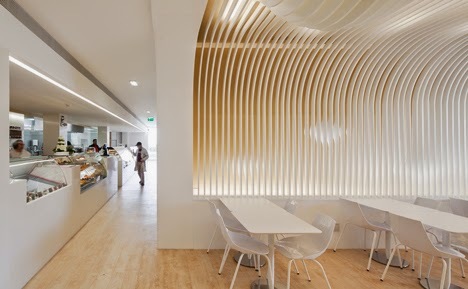 The OOZN Design team explained the design process ”We created an undulating skin of timber slats equally spaced apart at 150-millimetre intervals, which covers the entire wall and ceiling to break the monotony of spatial heights,” I like the finish to it. The chalky wall and the industrial lighting. My favourite, I think, is the timber logo on black glossy mosaics. It’s fantastic! Well done OOZN Design team! Massive Yay from me!! 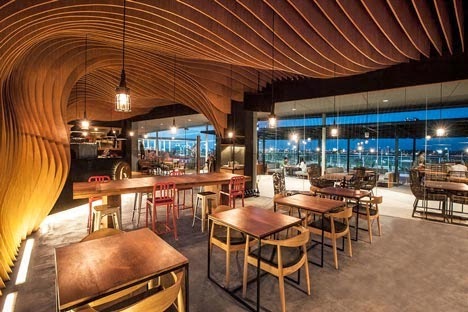 So, this is the concept of 6 degrees cafe, shall we have a look at images? and scroll down for further ones to compare! 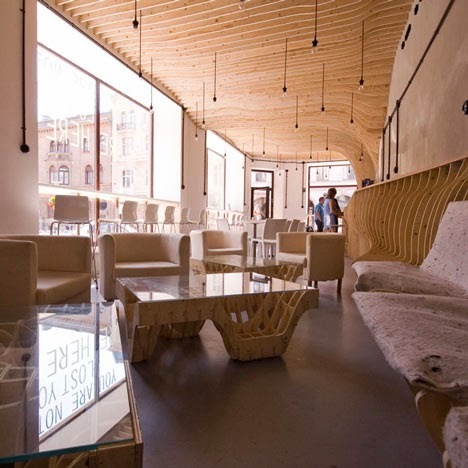 Next will be a Polish resturant and cafe ”Zmiana tematu” (appeared on Dezeen 11 May 2014). 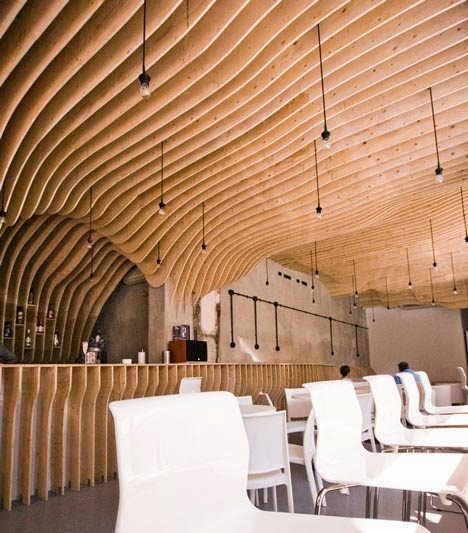 This curved plywood ribbed ceiling and walls was designed by Architects XM3. 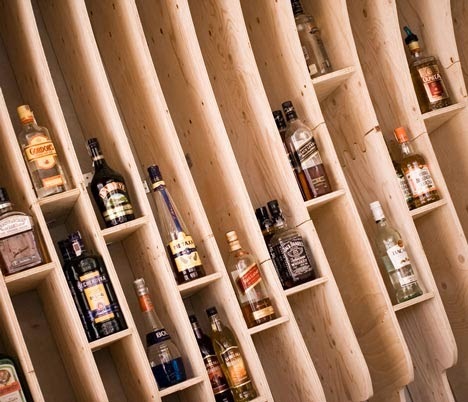 It’s very natural looking light timber slats and they used to their advantage the close slats and made shelving to hold bottles and glasses. 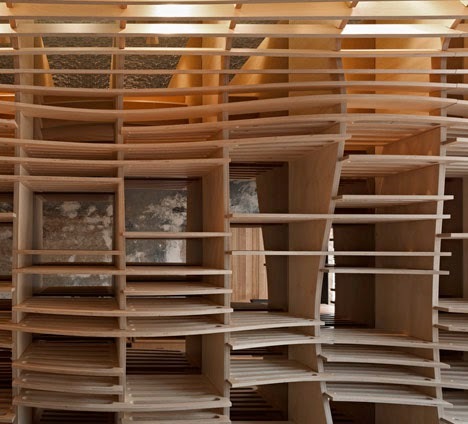 The architects described their concept ”As young architects from the Capital City Warsaw with the local ?ód? art-oriented youth investors we tried to aim at city’s condition and aspirations and create a reminiscent of the cutting-edge environment which has a connection with the city identity. The city’s name translates literally as “a Boat”. 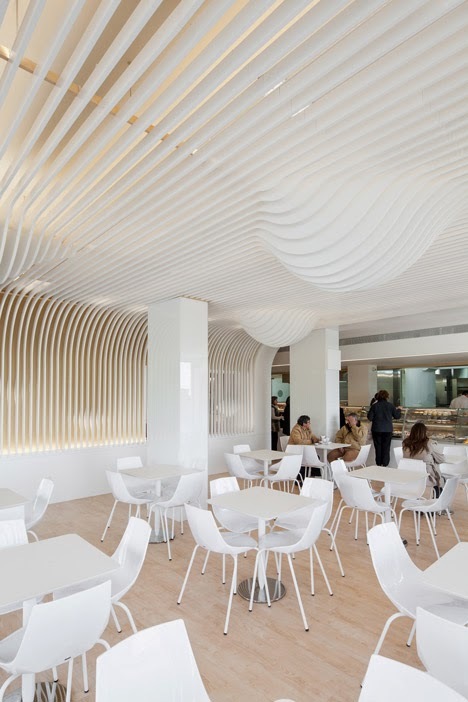 Inspired by a Boston BanQ restaurant we tried to create a blobbish form similar to the boat roof form which eats into the old monument-building’s space.” My eye was caught by those timber wavy tables with glass tops. 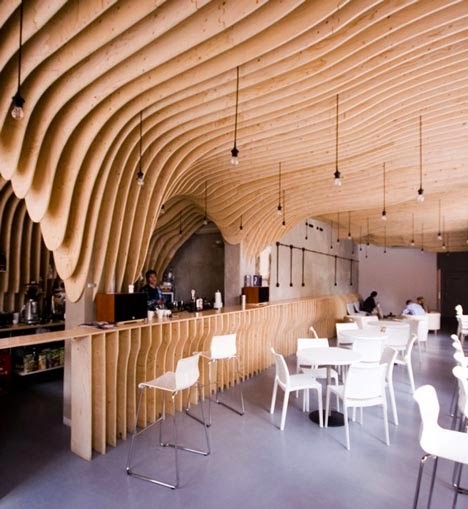 These organic shapes can be made by using Rhino software. 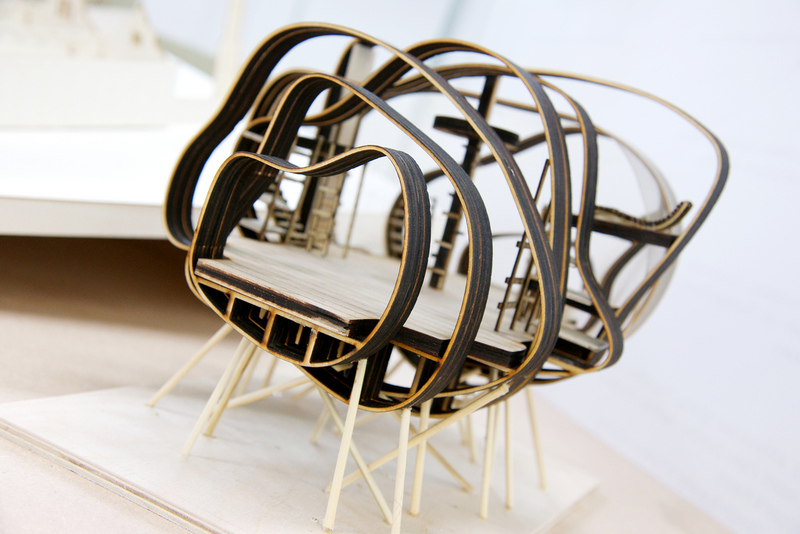 You can create many objects that can later be laser cut and just stuck together. I have used Rhino in University. I am not a master in it and I have to admit that I was quite struggling. 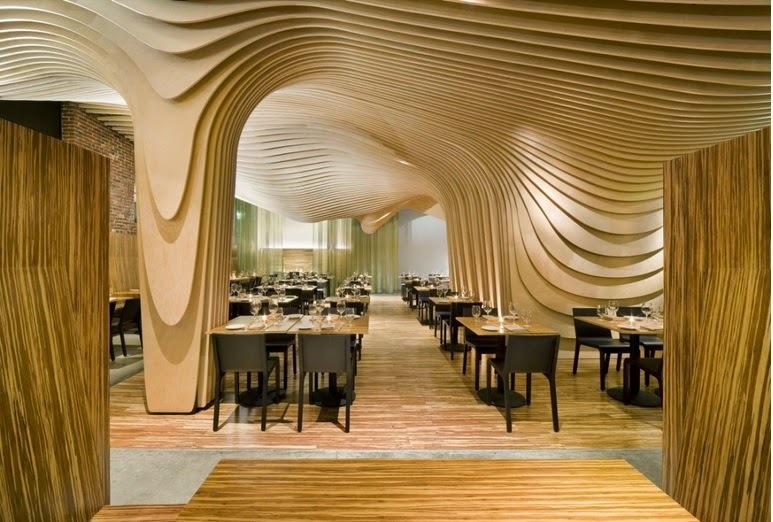 The beauty of Rhino is that you can create any organic shape and you let your imagination go! I just love that! (I need go get there one day!) Also I love the way how they finish the cafe, simple! plain, natural fabrics in grey and creams, simple chairs, and very simple lighting. The colours work really well together and I don’t think there is anything else needed. Well done Poland! 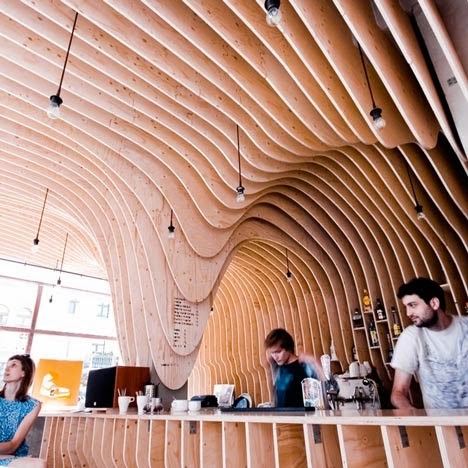 Lets have a look at stunning cafe from Lodz! 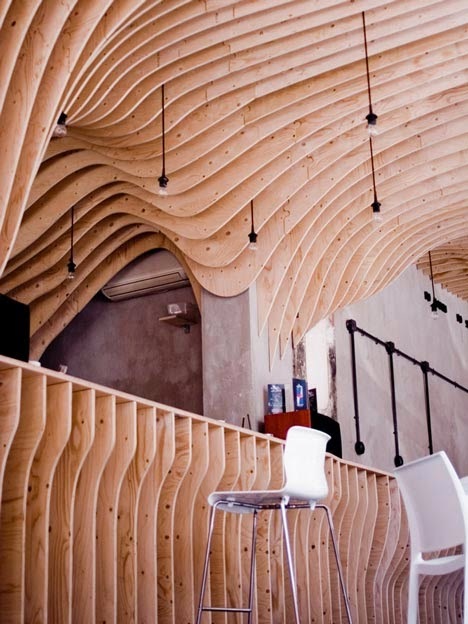 Yay wavy slats in Poland. 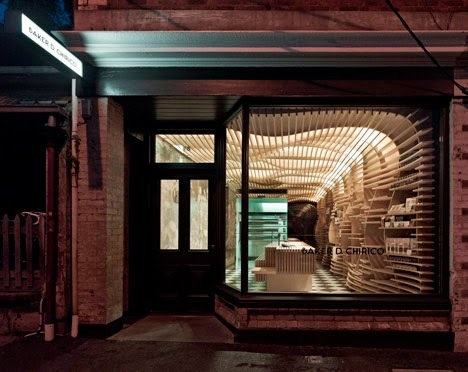 Next on our list of wavy slats is Baker D Chirico by March Studio. 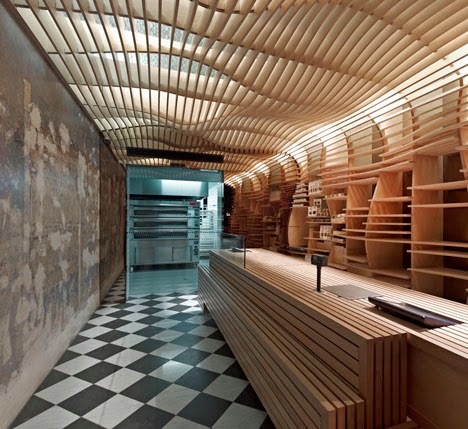 (appeared on Dezeen 23 February 2012) This Melbourne bakery concept is very simple, they wanted to achieve the look of an oversized basket! Well done! It does remind me of one! 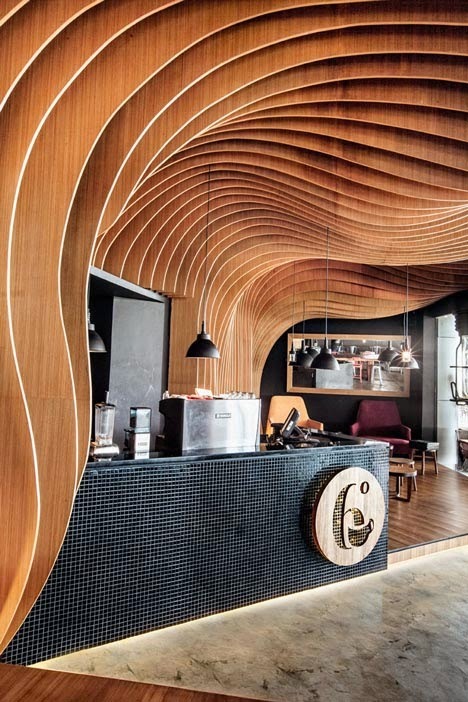 This is an undulation of CNC routed plywood forms; wall and ceiling look to me like they were also concept created in Rhino. 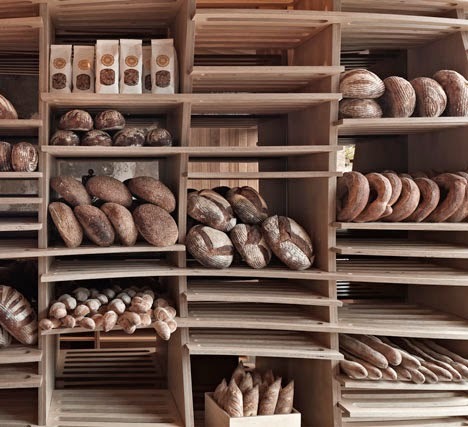 They have also used the close ribs form to make shelves for different sixes and shapes of bread. I like the large counter top. The only think I don’t like in this final design is the images without bread! It’s a cafe in the end and it should have one! The shelves look a little unfinished and like someone made a mistake and cut them wrong! Unfortunately it’s a Nay for it Always shows your design with products and people on! (my opinion) Let’s have a look at them. 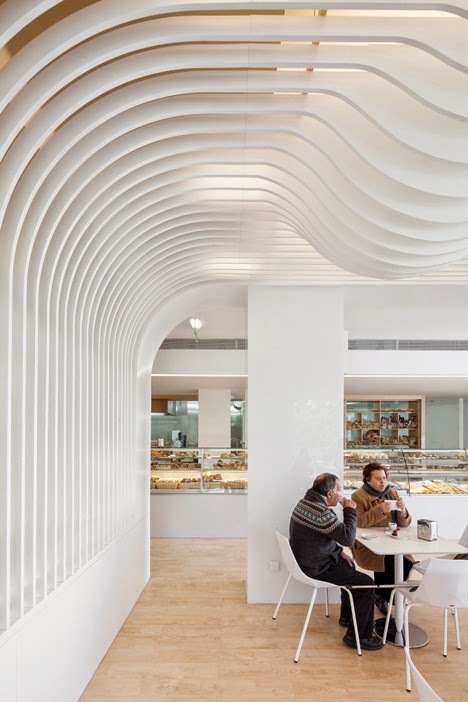 Another wavy slats design concept is Bakery in Porto by Paulo Merlini. 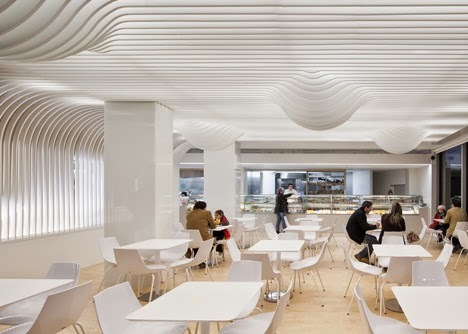 (appeared on Dezeen 13 August 2013) The concept behind is simple, it should remind us of dripping cake topping! Isn’t that great? 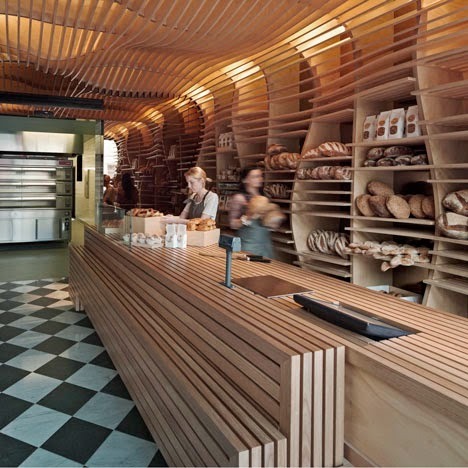 I love shapes like that, it makes me buy and eat more- which is maybe not as great when it comes to the hips and wallet To design this bakery more key important factors were, improving acoustics and also to reduce the lighting glare. 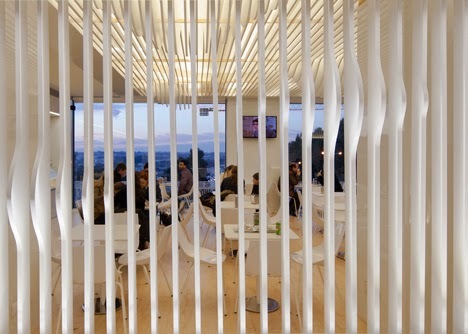 Also a hidden logo visible for customers was installed by Paulo Merlini behind the slats. I like the clear and aesthetic finish! Yay from me! Let’s check it out! 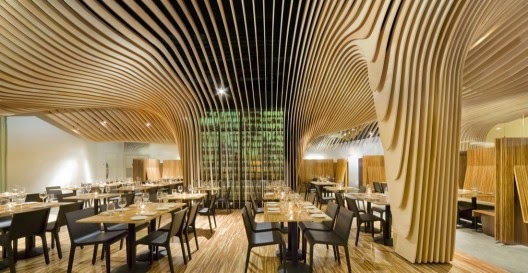 The last one is, I believe, the ”father” of all these further concepts, the Banq, Office DA Restaurant in Boston. 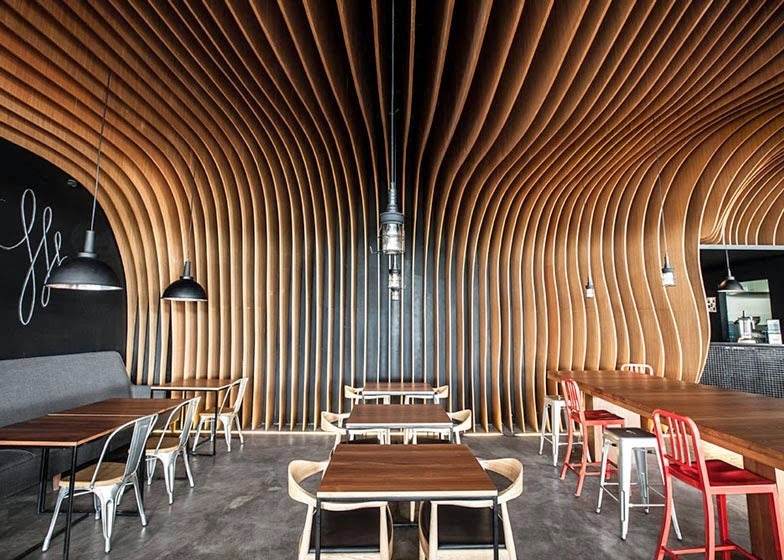 The designers and architects took the size, the location and the actual space geometry into consideration and designed the restaurant based on its longitudinal axis. What is unusual and different to all the above concepts is the perfect harmony and geometry in it. 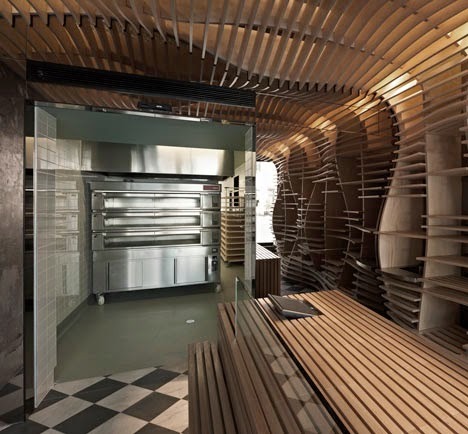 I found all the above stunning and amazing but the architects and designers of course changed their designs and personalized them, where the original concept remains just truly geometrical genius! Yay!! Although, I am not massive fan of the final touches (chairs, tables) as I found them boring. A little bit of colour would made this space just perfect! So for that I’ll give small Nay! Peace of art! I love the curly shapes, it feels like it was made natural. Cozy and elegant at the same time. 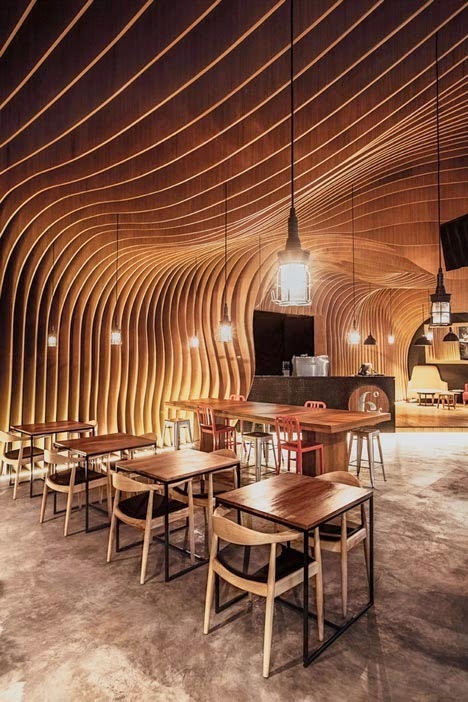 Jaiza Jumawan, I think most architects want to be interiors designers, and most interio designer want to be architects;p It''s like with a hair if you have a stragight you want curly etc. but the beauty of being interior designer/architect is that if we want change it we can always pick up a second course and we can make our skills even better! Good luck! 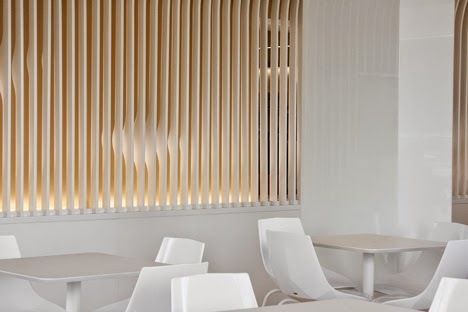 It's an interesting topic…I love how many different looks you can achieve by using these timber slats…modern, industrial, simple, organic, unique and many more. 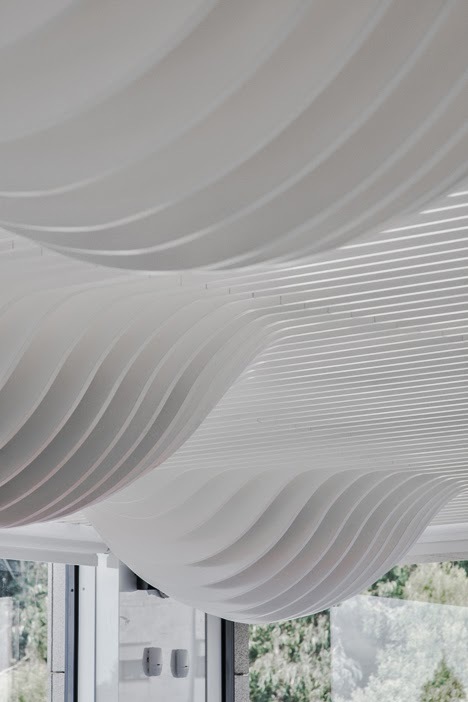 Also, as well as them being a decorative aspect of a design, in many cases, as we can see above, they can also be very functional, not to mention you can probably make any furniture or decor out of it.